The fresh taste of a Greek salad, the smell of moussaka and the joy of tzatziki on toasted bread. Don’t you wish you could take a piece of Greece with you after your holiday there? You can if you visit one of my Greek cooking workshops. Learn how to make these delicious dishes in an easy way. Return home as a great cook and impress your family and friends with your new skills. 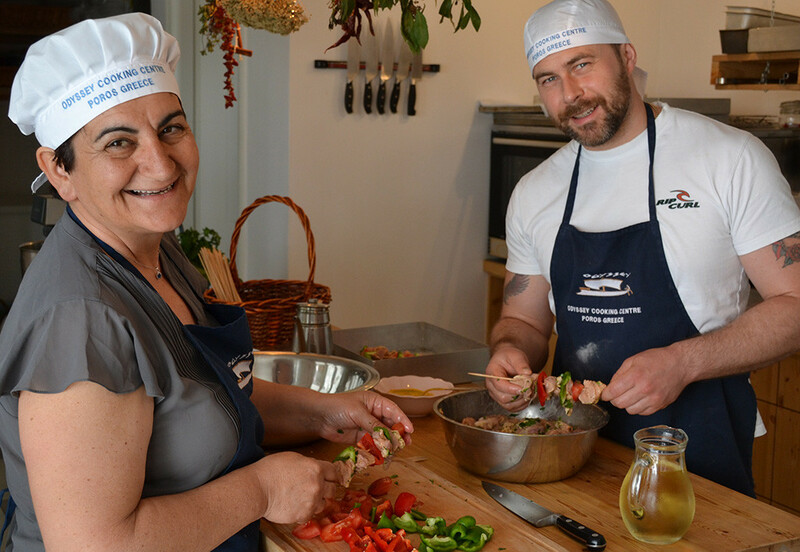 During my Greek cooking workshops I will teach you how to bake, cook, roast and grill using my family’s traditional cooking tricks and secrets. We will combine modern and traditional methods and learn correct chopping and slicing techniques. For fresh fish we go to the local market in Poros-town, where pastel-coloured houses are strewn across the mountainside. Yachts the size of palaces float next to fishing boats. We cross the small stretch of sea over to the Peloponnese peninsula, for a visit to my olive farm. There we harvest the fresh ingredients we need for the recipes, like tomatoes, eggplants, courgettes and basil. Grown under the Mediterranean sun, the vegetables are uniquely delicious. When all the hard work in the kitchen is done, it’s time to taste! In the evening we all eat together in the Odyssey bistro, surrounded by bougainvillea, geraniums and herbs in pots. Greek music plays in the background, while we enjoy the fruits of our labour together under the stars. Would you like to cook and create unforgettable experiences with me? You can follow a half-day workshop or book an entire week of cooking. I am very open to suggestions if there is anything in particular that you would like to learn. During the half-day workshops we make several starters, main courses and desserts. 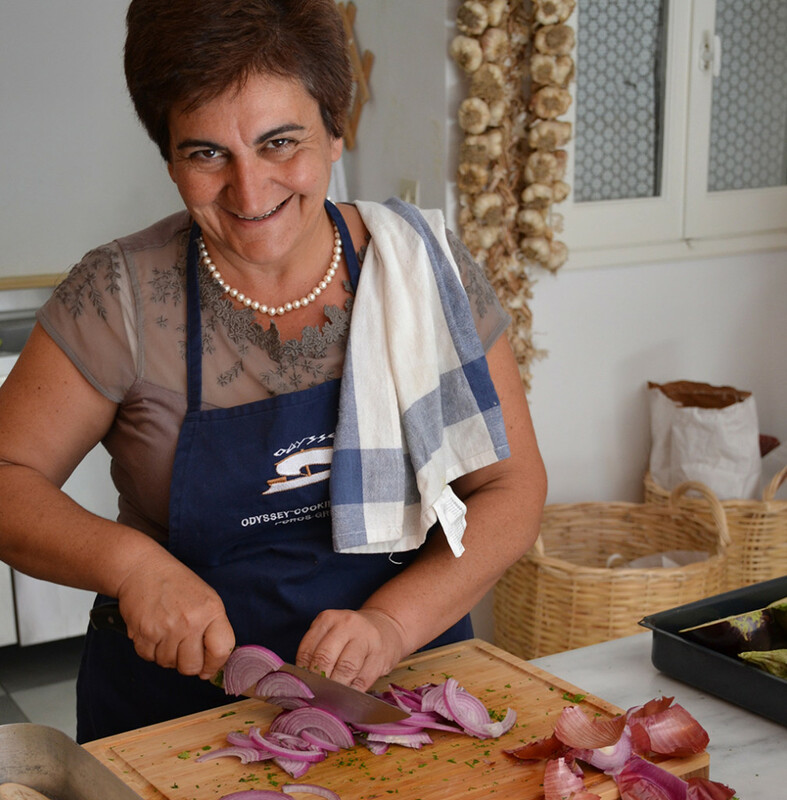 Come and discover my family ‘s Greek kitchen! The most popular is our Greek Cooking Week. This culinary holiday includes breakfast, lunch, dinner, accommodation, four cooking classes, an additional two excursions and a transfer from Athens or Athens airport to Poros. Katerina can give you a private Greek cooking workshop, but also teaches groups of up to ten people. In our half day Greek cooking workshop, we discuss the dishes that will be prepared with our chefs. Our rates start at 60 euro; workshop, ingredients and drinks are all included. For more information, availability and bookings email us at info@katerinaskouzina.com. • tasting the food and having some good local wines. The Odyssey is far more than just about the cooking though. It is truly a place where you are made to feel at home. The atmosphere is one of happiness, friendship and relaxation. When once asked which ingredient was used the most in Katarina’s recipes I at first was thinking of an array of herbs and spices. However, after my summer holidays spent cooking with Katarina I can honestly say that the one constant ingredient is love. It is an experience that you will never forget and have you wanting to return year after year. There’s something magical about Odyssey Centre and it starts with Katerina. Her big heart and generous spirit fill the air and bring out the best in everyone – staff and guests included. My two week vacation included a week in Santorini but it is the week in Poros I’ll always remember. It was the perfect recipe of relaxation, opportunities for fun excursions, and, of course, lots of time in the kitchen cooking, laughing, and drinking wine. I came home rejuvenated and excited to get into my own kitchen to try out the many new recipes I learned…and a little bit heartbroken about leaving my new friends. I had always wanted to go to Greece – even as a child, it was on my list of places I wanted to visit. As I approached a milestone birthday, I figured this was the summer to visit the country. 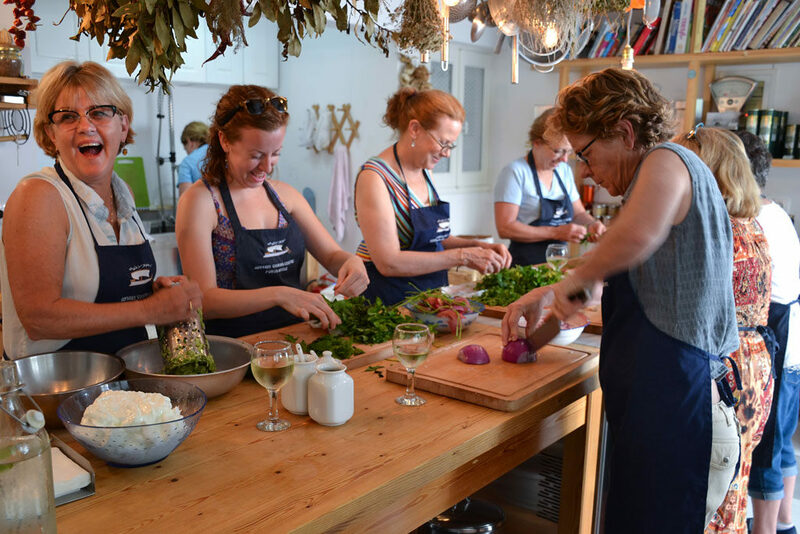 Since I have an appreciation for food (both preparing and eating – naturally), I figured there was no better way other than a cooking school to learn about and experience Greece. A quick Google search for “cooking schools in Greece” took me to Katerina’s cooking school. When I arrived in Poros, I was immediately in love with the location. After being in Athens for four days and seeing tourist attractions that I can remember now, the water and landscape of the island was a sensational welcome. When I met Katerina, it was if I had known her my whole life; I still joke that I must be related to her in some former life. Katerina’s Greek cooking school is like none other. Once you set foot in her presences, you immediately feel as if you’re family and you’re treated like family. That probably has to do with the fact that the staff at Katerina’s school work together like a family. Katerina takes time to know what you, as a student, want to experience while attending her school. She actively works to incorporate this and ensure that your time spent with her and with her staff is enjoyable. Katerina is selfless in how she works to accommodate you as a student. Her understanding of the Greek culture and history are vital ingredients to the overall experience she creates for everyone. With sneak peeks and tastes of the food being prepared, to afternoon cocktails with Mastiha, to learning secrets on how to perfect the perfect Baklava, the experience that Katerina will resonate with me for years to come. I couldn’t have asked for a better experience. Many of the visitors that were at the school during the time I was there had been there multiple times before. Needless to say, I can see myself going back in the years to come and never being disappointed.